Very quick and easy to create all of the legal documents we needed. Great value compared to paying up to $500 for a will drawn by an attorney. I have been pleased with this product since it's inception. That is why I ordered a newer version. That should say it all! 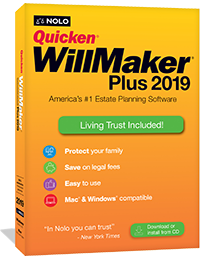 Quicken WillMaker Plus is the easiest way to create your estate plan, whether you're just getting started or you want to update your previous arrangements. This powerful software guides you through the process from beginning to end, giving you the practical and legal information you need to make the best decisions for you and your family. Quicken WillMaker Plus is the original will-writing software, created and updated regularly by Nolo's experts. Free legal updates will keep your program current through 2019. Technical support is also available. *Estate planning documents not valid in Louisiana, U.S.
1-year online subscription to Nolo's Promissory Note a $44.99 value! *Valued at $39.99 or less. Restrictions may apply. 172 Families started their estate plan today with WillMaker. Start your plan now! Ensure that your property bypasses lengthy and expensive probate proceedings. A durable power of attorney ensures that someone you trust (called your "agent" or "attorney-in-fact") will be on hand to manage the many practical, financial tasks that will arise if you become incapacitated. For example, bills must be paid, bank deposits must be made and someone must handle insurance and benefits paperwork. In most cases, a durable power of attorney for finances is the best way to take care of tasks like these. You can also give your attorney-in-fact authority over your digital assets. A clear and concise overview of the laws that affect families and personal relationships of all kinds. Quick, accurate answers to everyday legal questions, from adoption to elder care. Key family laws for all 50 states and extensive resources for couples, seniors, and children. Divorce, child custody, and visitation. Wills, living trusts, and estate planning. How many people can I name to serve my executor? Does the WillMaker will have a "common disorder" clause? "The best legal self-help site on the Web." Great DIY product! by Jay W.